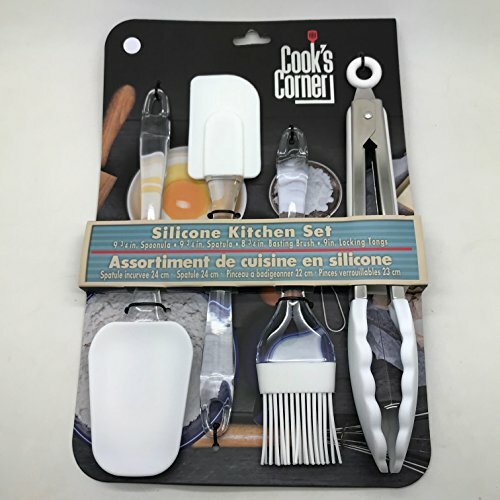 Cook's Corner 4-Piece Silicone Kitchen Tool Set (White) by Cook's Corner at Baking Love. Hurry! Limited time offer. Offer valid only while supplies last. Cook's Corner 4-Piece Silicone Kitchen Tool Set. This versatile set comes with a spatula, a spoonula, a basting brush, and a set of 9'' locking tongs. Cook's Corner 4-Piece Silicone Kitchen Tool Set. This versatile set comes with a spatula, a spoonula, a basting brush, and a set of 9" locking tongs. You'll have everything you need for a well-equipped kitchen. The tongs have a silicone handle for comfort and silicone heads for a secure grip. Great for serving, cooking, BBQing, flipping, grabbing, etc. The spatulas are easy to clean and store away. The beautiful mix of colors is sure to brighten up your cooking experience! Set includes the following: 1- 9 3/4 inch Spatula, 1- 9 3/4 inch Spoonula, 1- 8 3/4 inch Basting Brush, 1- 9 inch Locking Tongs. Product Care: Clean before initial use. Recommended to clean by hand in warm water and dish soap after every use. If you have any questions about this product by Cook's Corner, contact us by completing and submitting the form below. If you are looking for a specif part number, please include it with your message.